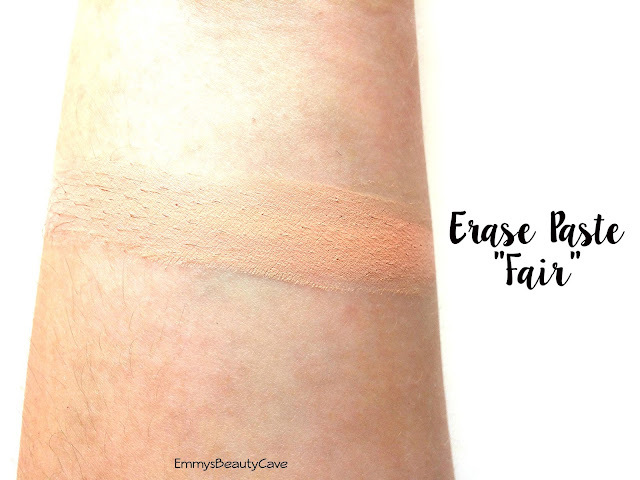 Benefit Erase Paste has been on my wishlist for months. I picked up the Becca Under Eye Brightening Corrector back in the beginning of the year and I loved it so I held off getting the Benefit version. My mum recently got me some Benefit bits from Duty Free. I will also be doing a post comparing the Benefit against the Becca Corrector as they are slightly different. Anyone who suffers with dark under eyes knows the struggle of covering them. No concealer on it's own will cover my dark circles completely hence me using correctors. Benefit always know how to produce pretty packaging. 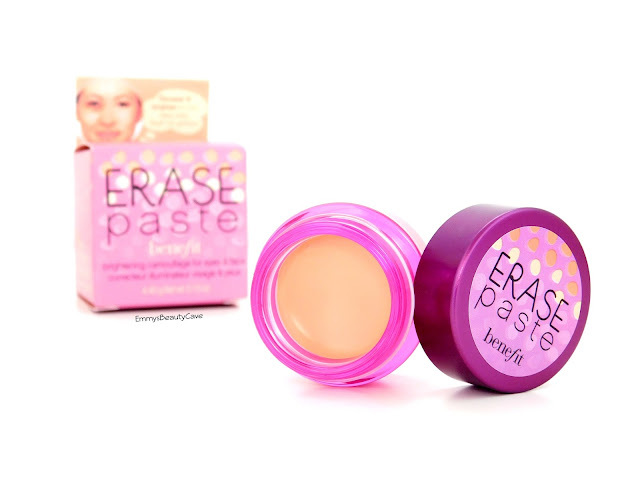 The Erase Paste comes in a small pink and purple pot. You also get a small spatula in the box which isn't something I use. I have gel nails which means putting your finger into the pot is a nightmare, I usually dab a brush into the pot and apply it that way then I will blend out with my finger. The Benefit Erase Paste comes in 3 shades, fair, medium and deep. I have the shade fair as I am pretty pale. 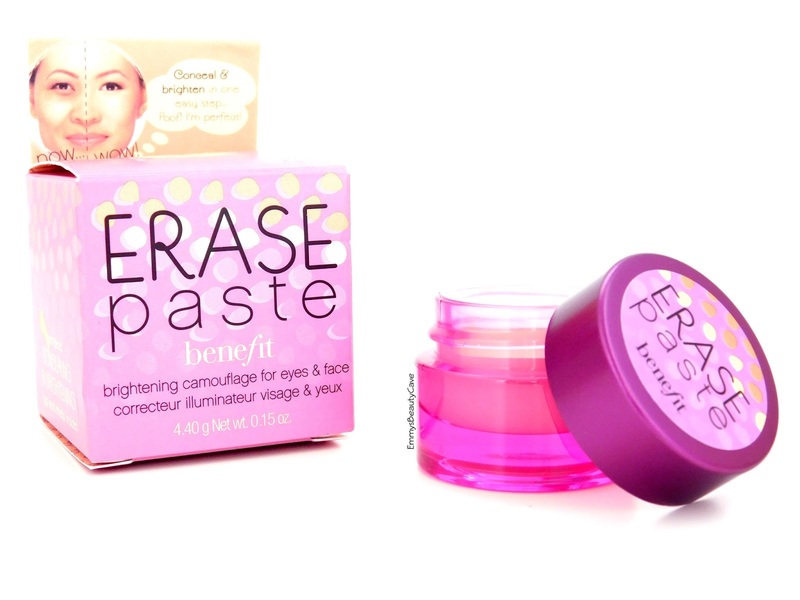 The paste is a peach/pink toned corrector which is perfect for those dark under eyes. The consistency is quite creamy and blends easily. I find I only need a small amount as it does spread well. When applying I like to apply below where my dark circles are then I blend upwards as this helps prevent creasing. It did a good job at corrector my under eyes. You cannot use the Erase Paste on it's own as it is a corrector not a concealer. You do have to apply a concealer on top. I usually go with a really creamy concealer like the Maybelline Fit Me or Urban Decay Naked Skin. Products blend easily on top of it and I didn't find I had anymore creasing than usual. Above you can see my before and after picture, the first image has no makeup on at all, the second image is just with the Benefit Erase Paste only and the third picture is with concealer and powder on top. I have read a few reviews where people found it made them oily. I have oily skin but only on my nose and chin. If you find you get more oily on your cheek area then maybe this isn't for you. I can see this working on dry skin too. The Benefit Erase Paste retails for £20.50 which isn't too bad at all. I will be comparing the Benefit Erase Paste VS Becca Under Eye Brightening Corrector with before and after pictures as they products are quite different in many ways.